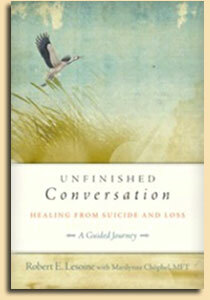 Unfinished Conversation is not only a story of profound grief, but also a guided journey to healing. The compelling story of Robert’s journey from anger and sorrow, disappointment and regret, to the possibility of acceptance and forgiveness, follows a common trajectory of grieving after the suicide and tragic loss of a loved one. After each brief chapter of the story, revealing a particular stage or action in the aftermath, readers are invited through a series of related questions, to reflect on their own experiences and memories in order to facilitate a transformative healing process. 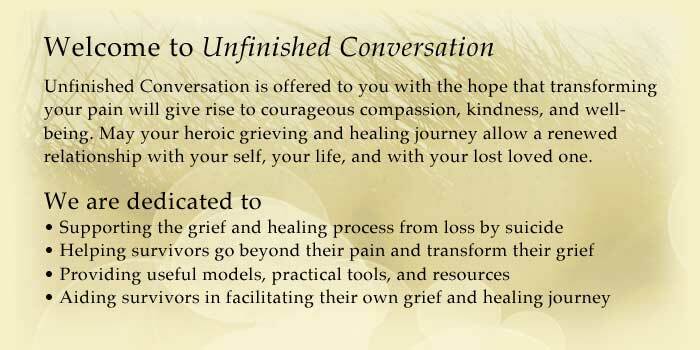 The tools and techniques in Unfinished Conversation will help you to release past trauma, affirm emotions, transform your pain, and honor your relationship with your lost loved one, to find greater perspective, meaning, and well-being in your life. Based on the book, a comprehensive package that provides everything you need to offer this 10-week guided healing process. The curriculum is designed for professionals who serve those touched by suicide loss including high schools, colleges, social service and mental health programs, suicide prevention services, hospice and grief services, suicide loss support groups, and other healing professionals. The package includes a Welcome Packet for Participants, Weekly Lesson Plans, and Instructional Materials for the Group Leaders, and can be used as-is, or can be adapted for the needs of your group. Overview of the Curriculum Package. Thousands of people nationwide walk in their local communities to raise awareness about depression and suicide, and provide comfort and assistance to those who have lost someone to suicide. Community Walks, Campus Walks, and Overnight Walks. Walk information and short video. Find the Walks in your state. Survivor Day Information and to find your local events. Every year, survivors of suicide loss gather together in locations around the world to feel a sense of community, promote healing, and to connect with others that have had similar experiences. Join with others in your community or online to listen to a diverse panel of survivors discuss their losses, how they coped, and much more. Note: To watch with English subtitles, Spanish, French, Simplified Chinese, Traditional Chinese, Korean, Japanese, Nepalese, Danish, Hindi, Italian, Portuguese, Russian, Arabic, Hebrew, or Swahili captions, click the CC button in the right-hand corner of the “Play” bar.